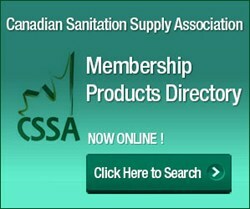 The Canadian Sanitation Supply Association (CSSA) announces that it has launched Membership Product Promotion Platform (M3P) that will be used to showcase and promote the products and services of its membership in an online source guide directory. This online directory presents us with an opportunity to proudly showcase and promote the brands, products and services of our membership to the vast end user market, not only in Canada but globally. CSSA is a Canadian, industry trade association representing the leading companies engaged in the manufacturing, distribution and selling of sanitary maintenance products and services. M3P is a specialized service offering by Cloud Search Portal, a leading provider of cloud based search technology services. M3P is specifically designed to meet the needs of associations that are looking for an online “Source Guide” solution for promoting the brands, products and services of their membership. In addition to providing a needed promotional service for the association membership, M3P also offers a unique advertising platform for those who are particularly interested in reaching decision makers and active participants within the industry that is served by CSSA. “CSSA is always trying to find new ways to provide valuable services to our membership,” said Mike Nosko, Executive Director of CSSA. “This online directory presents us with an opportunity to proudly showcase and promote the brands, products and services of our membership to the vast end user market, not only in Canada but globally . It also offers networking and connection opportunities between manufacturers, distributors, retailers and services providers within the industry .With M3P, CSSA will actually help members increase sales, visibility and market presence." The service works by using Cloud Search Portal technology to automatically crawl and index the websites of all CSSA member companies. As the website content is updated with new information, the CSSA directory will automatically refresh its search index to always present fresh and up-to-date information that is available in member websites. “Trade associations today are faced with the daunting challenges of having to deliver more value to their membership while collecting declining incomes from annual membership and, at the same time, facing escalating costs of operations," said Efrem Habteselassie, Founding Partner at Cloud Search Portal. “Association executives are looking for innovative solutions that help them deliver concrete benefits to their membership while ensuring low service delivery costs. M3P answers this demand and indeed offers opportunities for non-dues revenue generation from advertisers who want to target members of this industry." You may visit the CSSA website at http://www.cssa.com to see the Source Guide service in action.